The lowland wet forests of Hawaiʻi are in serious trouble. Human activity over the centuries has nearly decimated these unique ecosystems. The situation is so critical that even with constant weeding, many scientists and resource managers believe it is not economically or practically possible for these forests to return to an all-native ecosystem. “Unless we do some kind of management and restoration, we are not going to have native species in low elevation forests,” said Ostertag. A research team led by UH Hilo is testing a new strategy at the Keaukaha Military Reservation in Hilo in hopes of saving some of Hawaiʻi’s low elevation forests. The team is creating “hybrid ecosystems” where invasive species are cleared out and replaced with a combination of native and non-native plants. The selected non-native plants are not invasive and have traits that compliment the native plants. “Our idea is that we will create better functioning forest that will be better at keeping out invasive species,” said Ostertag. The goal is a self-sustaining forest where native species can once again regenerate and thrive, without much work after the initial investment. 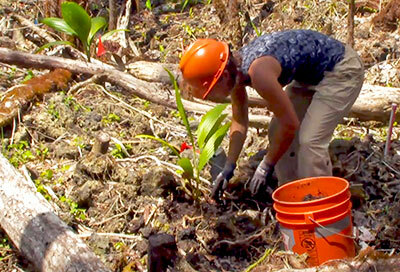 Reforestation work in Hilo’s low elevation forests uses a hybrid ecosystem strategy that involves planting both native and non-native plants. 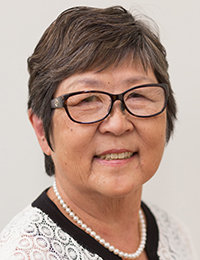 The project also offers a tremendous opportunity to UH Hilo undergraduate and graduate students, interns from other universities and local high school and middle school students to be a part of an ongoing scientific experiment. “I feel like you are a lot more attached to your work, you are a lot more passionate about it if you’re out there doing the work hands on rather than being stuck in a dorm room reading about it,” said Stephen McAuliffe, a Humboldt State University student who worked on the project during his summer break. “It is a great experience for them to see what it is like and to understand also what science is involved and what scientists do,” said Ostertag. In this case, UH Hilo scientists and students are thinking outside of traditional approaches in forest management to save an important part of Hawaiʻi’s heritage. Stanford University, the U.S. Department of Agriculture Forest Service Institute of Pacific Islands Forestry and the Hawaiʻi Army National Guard are also partners in the $1.5 million, five-year project, called Liko Nā Pilina. Loosely translated, it can mean growing new relationships. The project is funded by the U.S. Department of Defense Strategic Environmental Research and Development Program. Read more about Associate Professor Ostertag’s research.